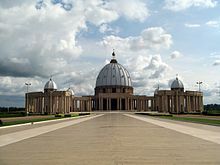 The Basilica of Our Lady of Peace is a Catholic minor basilica dedicated to Our Lady of Peace in Yamoussoukro, the administrative capital of Côte d'Ivoire (Ivory Coast). The basilica was constructed between 1985 and 1989 with different cost estimates given by various groups. The designs of the dome and encircled plaza are clearly inspired by the Basilica of Saint Peter in Vatican City, although it is not an outright replica. The cornerstone was laid on 10 August 1985, and it was consecrated on 10 September 1990 by Pope John Paul II, who had just formally accepted the basilica as a gift from Félix Houphouët-Boigny on behalf of the Vatican Church. This article uses material from the Wikipedia article "Basilica of Our Lady of Peace", which is released under the Creative Commons Attribution-Share-Alike 3.0 License.